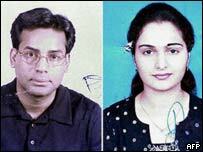 The gangster Abu Salem, who appeared in court on Friday, is one of the Indian underworld's most dreaded figures. 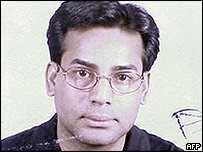 Indian police accuse Abu Salem of involvement in attacks in Mumbai (Bombay) in 1993 that killed more than 250 people. Indian investigators also want to question Salem in connection with more than 60 murders as well as cases of extortion and kidnapping involving Bollywood film producers and actors. Abu Salem, alias Abdul Saleem Ansari, is charged with being involved in the bombings which rocked India's commercial capital in March 1993. Salem fled India after the bombings, which left 1,000 injured, with his companion and former Bollywood actress Monica Bedi. The couple landed up in Portugal and lived in the capital Lisbon among the expatriate Indian Goan community. But their luck ran out in 2002 when they were arrested by the Portuguese police at the behest of the Interpol. 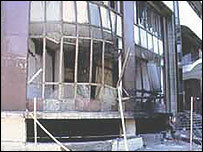 India had pressed for their extradition since their arrest. A Portuguese court sentenced Salem to four-and-a-half years in November 2003, for possession of forged documents and resisting arrest. Bedi was sentenced to two years for using false documents. Portugal agreed to extradite Salem and Bedi after assurances from India that they would not face the death sentence if they were returned. Indian authorities say Salem, an Indian Muslim, is a key associate of Indian crime lord Dawood Ibrahim, the country's most wanted man. Dawood Ibrahim is also suspected of involvement in the bombings, believed to have been carried out in revenge for the deaths of hundreds of Muslims in riots in 1992 blamed on the right-wing Hindu Shiv Sena party. According to Indian officials, Dawood now operates out of the Pakistan. Like most other gangsters who joined the Bombay mob in the late 1980s and early 90s, Abu Salem started as a small timer in the Dawood gang. A native of Saria Meer in Azamgarh district of Uttar Pradesh, Abu Salem is believed to have begun his career in Delhi as a taxi driver. He moved to Mumbai in the mid-1980s and embarked on a career of petty crime while operating a telephone booth in the northern suburb of Andheri. It was during this time that he established contact with Dawood Ibrahim's younger brother, Anees. Soon Abu Salem became a gun runner for the Dawood gang. His job was take the gang's arsenal from one point in the city to another for the hit men and sharp shooters of the gang. He quickly also began extorting money from builders in the city and Bollywood personalities on behalf of Dawood. But until the mid-1990s he was still among the scores of second- and third-rung lieutenants who were loyal to Dawood and helped carry out the orders of their boss in the city's underworld. It was the sensational daylight killing of Bollywood producer and music baron Gulshan Kumar in 1997 which catapulted Abu Salem into the big league. A few months later the police also charged him with an attempt on the life of another well-known Bollywood producer, Rajiv Rai. Bollywood now started dreading the mention of Abu Salem, who used the Gulshan Kumar murder and the attempt on Rajiv Rai to terrorise figures in the Indian film world. The growing clout of Abu Salem in Mumbai, particularly in Bollywood, brought him into direct conflict with Chhota Shakeel, another notorious gangster. Chhota Shakeel had over the years risen in the underworld hierarchy to become the unofficial second-in-command of the Dawood gang. Abu Salem split from the Dawood gang in 1998. According to the police, he was behind the killing of Ajit Deewani, secretary to the movie actress, Manisha Koirala, in 2002. Abu Salem's clout with Bollywood producers during the late-90's is the stuff of legend in India's film industry. The police believe he routinely extorted producers and then went on to produce some films himself. He also met starlet Monica Bedi and began living with her. The police say that he pressured Bollywood producers to include Bedi in their films in spite of a spate of flops. Times have changed radically in Bollywood since Salem fled India. It is widely believed that the city's underworld does not dominate the industry in the way it used to in the 1980's and 1990's.